Don’t miss you chance to visit the La Palme Campsite, as you travel through the Languedoc-Roussillon and the surrounding area. This campsite, 3-star rated, offers a quiet and natural charming setting, for a particularly relaxing and pleasant holiday with friends or family. La Palme is located in an exceptional area, not far from Port La Nouvelle and Port Leucate. Your stay at this beautiful 3-star campsite is also the opportunity to enjoy the beautiful sand beach, only 5 minutes from the campsite by car. 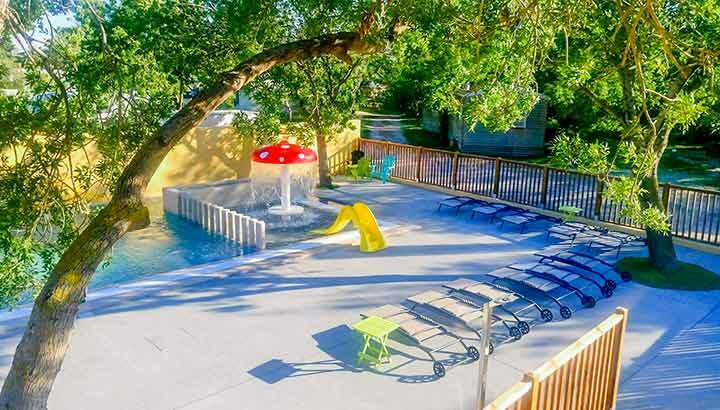 In addition, the campsite has all the services and facilities you need for an excellent stay, including heated pool, shops, restaurants, the bakery, convenience stores, etc. 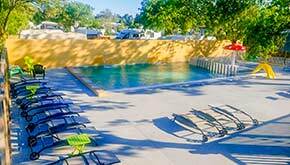 The La Palme campsite’s heated pool will delight young and old! 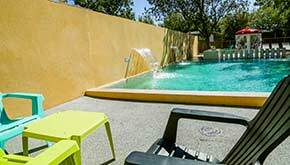 Relax by the pool under the Mediterranean sun, as you enjoy your stay at this campsite near Leucate. 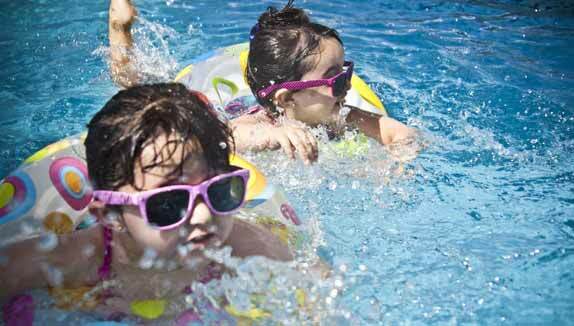 Children, accompanied by their parents, can discover the joys of water and enjoy the wading pool for some safe fun. For you adults, take the time to relax during your stay at La Palme. You can lay out on the sun loungers and enjoy the massaging jets. 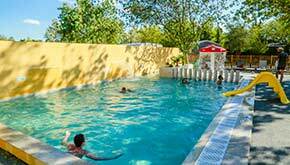 The pool is the perfect place to tan and relax during your holiday at this campsite between Narbonne and Perpignan, with family or friends. 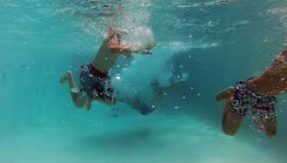 In addition to the heated pool, the pool area at La Palme has water games including the wading pool, so that your children can also have fun, while you swim in the pool. 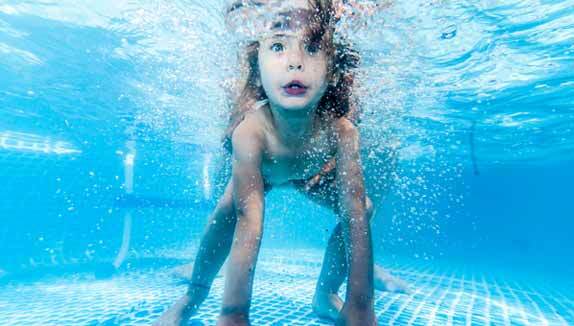 Other water games are also available so that your children will never get bored. 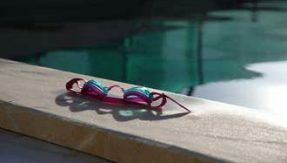 On sunny days, the pool is the best place to tan and lay around for hours on the sun loungers, located all around the pool. Parents can relax, while kids have fun in their area. For even more fun, don’t forget to spend some time with the massaging jets where relaxation is on the menu. There’s nothing better for recharging on vacation! Even though La Palme is only a few minutes from the beach, it is always nice to have a heated pool on the premises. 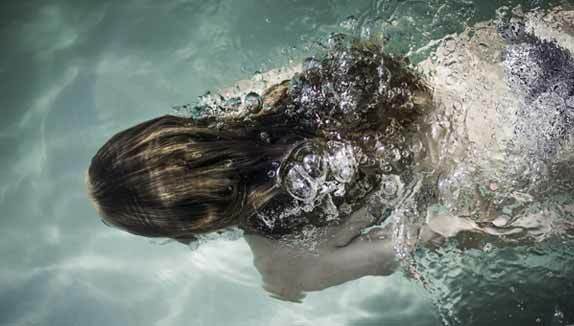 After a long day, it is easier to swim on-site, instead of leaving again. 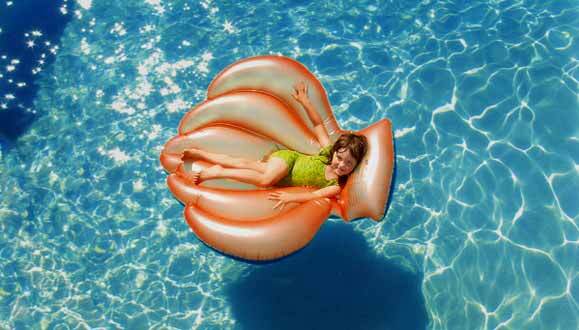 Also, we have everything you need for relaxing at the pool (sun loungers, parasols, etc.). 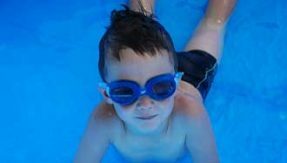 The heated pool is also good for people who get cold easily since it is always the right temperature, whatever the weather. 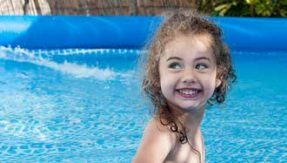 Additionally, children are always safe since they remain in view of their parents and the facilities are generally very safe. 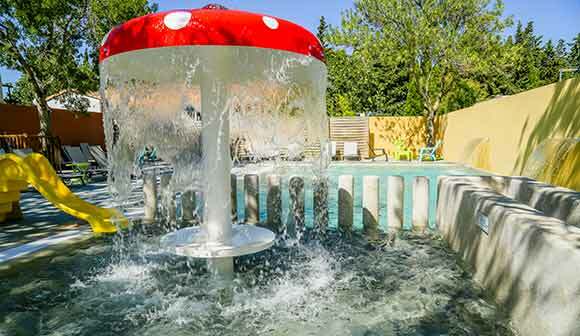 And of course, we have many water games and well-being zones such as the massaging jets, for total relaxation in a welcoming atmosphere.